Disclosure: I was not compensated for this post, but did receive items complimentary for review purposes. Some affiliate links are in post. As always all opinions are my own and honest. Preparing 2 preschoolers each morning to walk out the door can be a task. 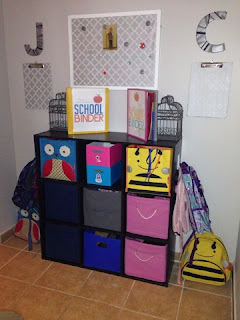 So over the summer, I worked on making a system for my family in order to speed of the process in the morning so I won't forget anything, plus give the kids their own routine and independence. Now a month into the school year for both the kids and parents, we have our routine. 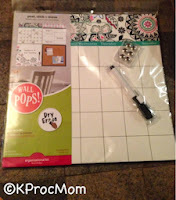 Located in my kitchen is our Organizer Kit by WallPops! 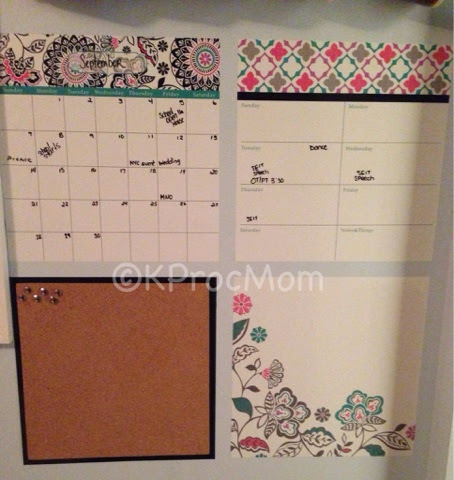 A 4 piece peel and stick set that is also dry erase and includes a cork board and push ins. 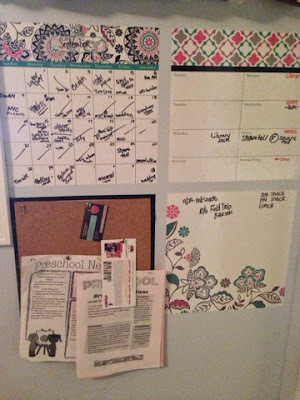 A monthly calendar, weekly calendar, message board to layout your schedules. I use the weekly planner to keep track of recuring events for everyone, message to note future events in upcoming months and things I need to do/buy and important papers pin to cork board easily. This set and its central location have made it easy to know where everyone is and what everyone has going on in our house. 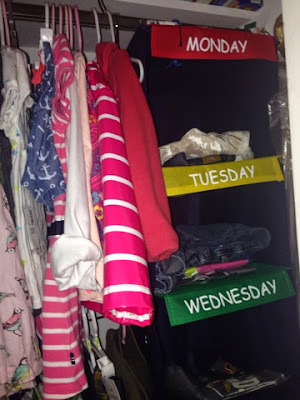 With 2 kids getting dressed in the morning, socks flying, underwear missing and crazy outfits would be the norm this year until I found a closet hanging weekly clothing organizer. JACKPOT! This was I can pick out a week's worth of clothing for both in advance so in the morning I hand clothes to kids and they get dressed. I made this command center at the end of last school year. I was tired of shoes, papers, bags being thrown all over my house. 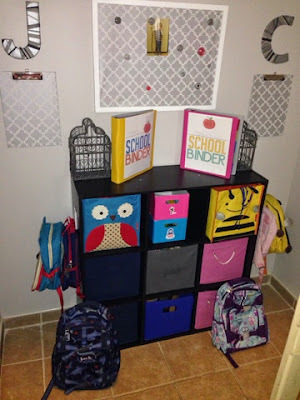 This 9 bin storage unit is great for shoes, hats/gloves, and papers for each kid. I love SkipHop, so each kid has all matching accessories in same "print/animal", Jack is Owl and Charlotte the Bumble Bee (we have everything for this set). Their papers go in the character bin, on the clipboards they pick out work to hang up. Invites/notices go on the magnetic board and in binders are class lists, curriculum sheets, classwork and notes. Can you tell I like to be organized? The shoes are in the bottom bins on left/right sides and back packs hang on the sides. Jack and Charlotte are great about putting their shoes away and putting on their shoes in the morning. The command center is located at the bottom of the stairs for easy access. 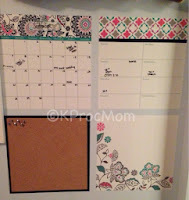 Want to win your own WallPops Organizer Kit? Enter today! I lay out clothing the night before. We have a coat hook at the front of the door where I keep their back packs. We don't have a very large entry way so I have a shoe bench & bins for shoes.